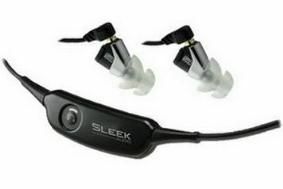 Sleek Audio adds wireless to its in-ear 'phones | What Hi-Fi? The new W-1 wireless adapter is available in the UK from next Monday, October 27, via Hi-Fi Headphones. Developed in association with wireless specialists KLEER, it has a range of 18m, and can serve up to four pairs of headphones. It's compatible with any audio device with a headphone socket, and offers up to 10 hours of independent battery life. Designed to sit behind the neck, it can be secured under clothing to hold it in place while exercising. And should the batteries run down the modular design of the headphones allows cabled operation to be reinstated. The wireless adapter will cost £93, and the Sleek SA-6 headphones themselves are £150.